Zoar Valley is 2,297 acres of beautiful and dangerous canyon river valley for fishing, hiking, rafting, canoeing and kayaking. 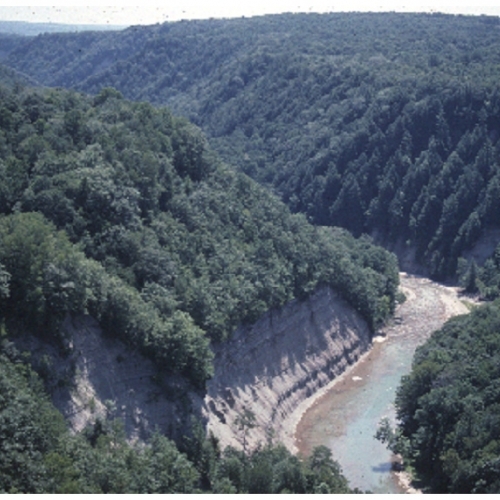 Zoar Valley and the Cattaraugus Creek act as the natural northern border of the Enchanted Mountains between Erie County and Cattaraugus County. Note: Some areas of Zoar Valley are very dangerous due to very steep walls and unstable rocky terrain. Go fishing on the Cattaraugus Creek in Zoar Valley! Cattaraugus Creek has been listed in the top 10 Steelhead Fishing sites by fishing magazines. Stay on the hiking trails for your own safety. There are rocky overhangs and trees that appear stable on the edge of cliffs but steer clear as most of the underlying rock is unstable. Join a group and go canoeing or kayaking. For a kayaking group in Zoar Valley, we recommend meeting up with the Zoar Valley Padding Club. Some sections of the Cattaraugus Creek have Class III rapids! Make a reservation with a whitewater rafting guide. 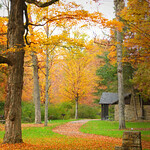 Please note that some areas of Zoar Valley are private property and are restricted. View real-time information about the Cattaraugus Creek in Zoar Valley. View more information about the Zoar Valley Multiple Use Area on the New York State DEC websiteincluding SAFETY INFORMATION! Zoar Valley MUA has the TALLEST Basswood tree in the world! According to the DEC, a 128 foot tall basswood within Zoar Valley has been reported to be the tallest basswood in the world.